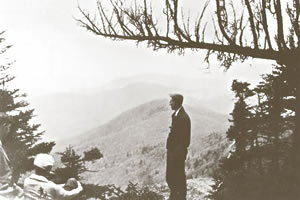 Benton McKay is credited with conceiving the idea of a continuously marked trail along the crest of the Appalachian Mountains. McKay wrote about his vision in an article that appeared in the Journal of the American Institute of Architects in 1921. The first section of the trail was constructed in Harriman State Park in New York in 1922; the final section was added in Maine in 1937. His initial 1921 “project in regional planning” was a proposal for a network of work camps and communities in the mountains, all linked by a trail that ran from the highest point in New England to the highest point in the South. He called it the Appalachian Trail. MacKaye was convinced that the pace of urban and industrial life along the East Coast was harmful to people. He envisioned the A.T. as a path interspersed with planned wilderness communities where people could go to renew themselves. That idea never gained much traction, but the notion of a thousand-mile footpath in the mountains fired the imaginations of hikers and outdoorsmen from Maine to Georgia. Inspired by him, they began building trails and trying to connect them. What Was His Connection to ATC? MacKaye was responsible for convening and organizing the first Appalachian Trail “conference” in Washington, D.C., in 1925. That gathering of hikers, foresters, and public officials embraced the goal of building the Trail. They established an organization, called the Appalachian Trail Conference, appointed MacKaye as its “field organizer,” and named Major William Welch, manager of New York’s Harriman Park, as its first chairman. The Appalachian Trail Conference became the Appalachian Trail Conservancy in 2005. Some perfunctory scouting of routes took place. A few short sections were marked and connected. New trails were built in New York. Welch designed a logo and Trail markers. Committees met in a few northeastern states and talked about the idea. But, for several years, the idea didn’t really go anywhere. MacKaye was much better at inspirational abstract thinking than practical organizing, and it soon became apparent that someone else was going to have to take the lead for the Trail to actually get built. Who Pushed the Project Forward? Two men, retired Judge Arthur Perkins of Connecticut and admiralty lawyer Myron Avery of Washington, D.C. Perkins took the idea and ran with it, essentially appointing himself as the acting chairman of ATC in the late 1920s and recruiting Avery to lead the effort in the area around Washington. Both began vigorously proselytizing the idea of the Trail in 1928 and 1929, championing MacKaye’s ideas to recruit volunteers, establishing hiking clubs up and down the coast, and actually going out to hike, clear brush, and mark paths themselves. 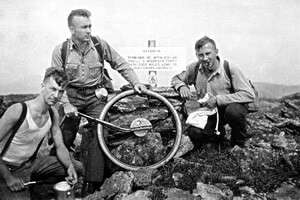 As Perkins’ health failed in the early 1930s, Avery took over, devoting incredible time, energy, and willpower to establishing a network of volunteers, developing clubs, working with the government, building the organization of the ATC, and setting the Trail’s northern terminus at Katahdin in his native Maine. Avery remained chairman of ATC until 1952.